In 1991 René Nielsen thought that he had life under control. His career as a major league handball player looked more promising than ever, his job was on track, and he had moved in with the woman of his dreams. But one night in April René’s life was suddenly and savagely pulled apart. That night he lost both his legs in an inexplicable train accident. With rare perseverance he fought his way out of bitterness. In spite of the accident he chased his dream and became one of Denmark’s premier athletes. But according to René Nielsen life’s great battles are not fought in the field, but inside yourself. 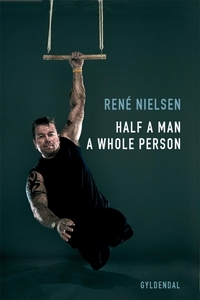 Some of René’s strength can paradoxically be ascribed to a tough childhood, but also to a strong marriage with his high school sweetheart Helle, who is unfailing in her love for René – with and without his legs. Half a Man – a Whole Person is an immensely compelling, life-affirming, and very personal story about how a man and a human being may find himself and move on with life even if the unthinkable happens.